Until a few years ago, Wayan Tuges had no idea what a guitar sounded like, let alone made one from scratch. Today, his instruments can sell for thousands of dollars each. From Bali, Indonesia, the story of how a traditional wood carver and spiritual leader turned his skills into an unlikely global business crafting high-end guitars. A radio feature for PRI's The World. Wayan Tuges uses a chisel to etch a pattern into the face of a new guitar. Wayan Tuges inspects a work in progress at his Bali guitar workshop. 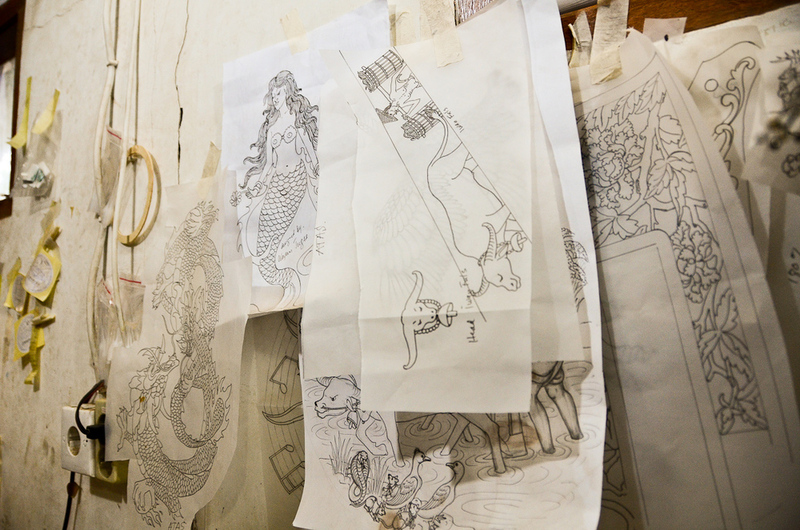 Sketches for designs that will decorate future guitars are taped to the walls of Wayan Tuges's Bali workshop. Wayan Tuges uses a mallet and chisel to etch a pattern into the face of a new guitar. Wayan Tuges looks on as an assistant assembles a new model: a double-necked acoustic/electric hybrid guitar. Wayan Tuges inspects an early prototype of a new guitar model: a double-necked acoustic/electric hybrid. 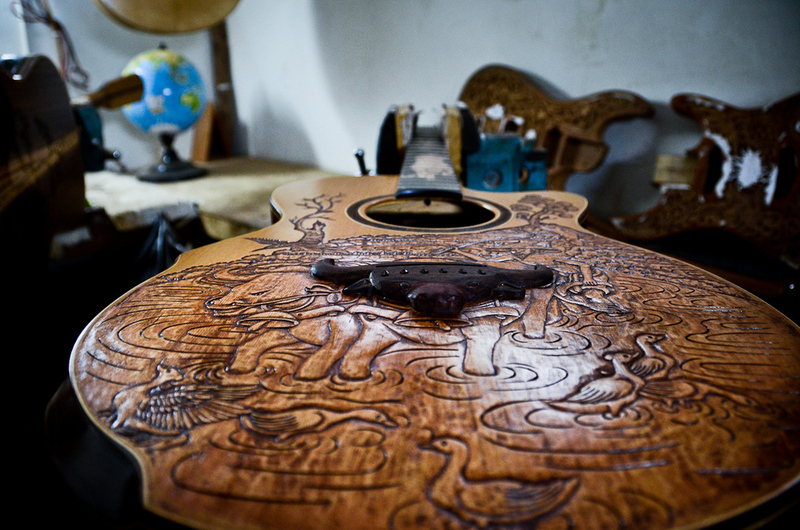 A guitar in Wayan Tuges's Bali guitar workshop nears completion. Wayan Tuges holds up a prototype for a new guitar: a double-necked acoustic/electric hybrid. Wayan Tuges holds up a double-necked guitar in his workshop storage room.